The domain was booked on September 28 by Antti Rantanen, who appears to be an employee of Sanctuary Records in the UK. Currently there is nothing at the address except for a placeholder page. Dolores O’Riordan’s long-awaited solo album finally has a title and concrete release date, Billboard reports this evening. Dolores’s debut solo album will be called Are You Listening? and will release on May 8, 2007 in the United States on Sanctuary Records. In Europe, the album will release on Sanctuary’s newly restarted sub-label, Sequel. A yet-to-be-announced single will release in late April. We will have more details as they break! Rock legend Meat Loaf this week told York University’s student newspaperExcalibur that he likes The Cranberries. The interviewer asked him what other food-item-named-things he likes, to which he responded a UK singer by the name of Fish and of course the Irish band with the tart but delicious name. French singer Dominique performed The Cranberries’ “Zombie” last Friday night on the French Idol-like TV show “Star Academy.” Dominique is in the running against other winners for the best weekly performances. You can watch Dominque’s performance here at the TF1 website, which includes some rather elaborate choreography with, er, flight attendants and a giant airplane prop. Thanks to Cyril for the news. Dolores O’Riordan has finally found a label for her forthcoming debut solo release, the Ulster Herald reports today. Sanctuary Records will release the new record which is due in early 2007. Sanctuary’s roster includes Morrissey (formerly of The Smiths), Iron Maiden, Tegan and Sara, and Crosby & Nash. The label specializes in artists who already have established careers and solid fanbases. Sanctuary handled the release of The Cranberries’ Beneath the Skin Ver. 2 DVD in the United States. A source close to Dolores told Zombieguide that the album is nearly finished and that the search for a record company was the main factor in its delay. We’ll have more details as they become available! 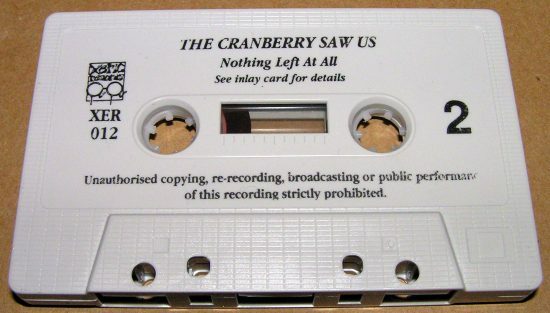 A fan who recently purchased The Cranberries’ first commercially-produced demo tape has made high-quality photos and MP3s of the tape available online. While “Water Circle” was The Cranberries’ first demo tape in May 1990 (then called by the dreadful pun The Cranberry Saw Us), it was home-made and its liner art photocopied. 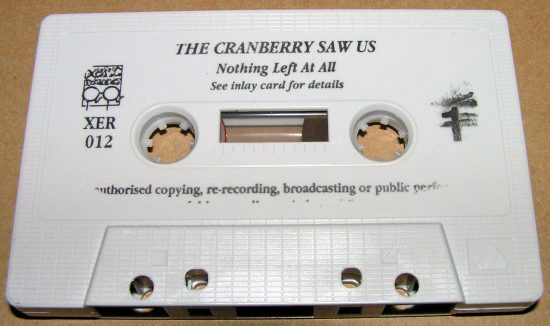 Later that year, Xeric Records released just 300 copies of the Saw Us’s first commercially pressed tape, “Nothing Left At All” (discography entry). Zombieguide Forums member Caputokey was lucky enough to snag the extremely rare piece off of eBay months ago and has since put up MP3s and photos on his own server. 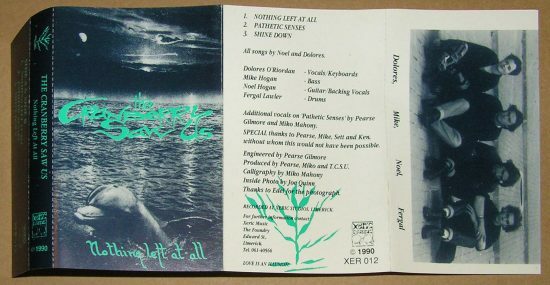 “Nothing Left At All” is the same version that appeared in CD quality on the “Uncertain” EP. “Pathetic Senses” is different from the “Uncertain” EP and features vocals from Dolores’s (allegedly aggressive) boyfriend Miko Mahoney (also did the vocals at the end of “Dreams”) and producer Pearse Gilmore, whom the band accused of making secret agreements with Island during the band’s last days at Xeric. “Shine Down,” later known as “Take My Soul Away,” is the most elusive of the three. This is by far the best recording of “Shine Down” to ever surface. Some short biographies released in conjunction with the proposal of a new radio station for Limerick, Heart FM (read more), include some tidbits about what Mike Hogan and Fergal Lawler have been up to lately. If the radio station is approved, Mike Hogan will become a director for Heart FM. Also, Noel, Mike, and Fergal will give some hands-on input for a show called “Green Heart,” which will showcase demos and upcoming local bands. The bio also reveals that Mike opened a café on Catherine Street in Limerick called The Sage Café earlier this year. The café opened in mid- April and seats 45-50 people. Mike has become the director of a company called TM Coffee, Ltd. (which runs the cafe), and he continues to to live and work in Limerick. Heart FM, a new proposed radio station being funded by Mike and Noel Hogan that we first told you about here, gave an oral presentation on Monday to the Broadcasting Commission of Ireland. The Hogan brothers and Fergal Lawler are among a small group of investors who are competing to win a 10-year broadcasting license in Limerick. In order to win approval for the station, the Heart FM backers will need to wrestle the city’s radio franchise away from the incumbent broadcaster, Live 95FM. The Heart FM group told the BCI that if approved, the station would make a profit of â‚¬15-â‚¬20 million over 10 years. The station would also employ 36 full-time and 33 part-time staff, more than Live 95, and would open a new 5,000-sq ft office in downtown Limerick. The BCI will decide on January 22, 2007 which group will receive the new license. You can check out some attractively designed proposal PDF documents at the BCI website. Of special interest to Cranberries fans are sections 3 and 4, which have short up-to-date biographies on Noel, Mike, and Fergal. Maurizio di Bona, a.k.a. theHand, who created a line of official merchandise for The Cranberries in 2003, has just released a new book that includes four pages of Cranberries caricatures. di Bona, a longtime Cranberries fan, had put several of his Cranberries cartoons online before the band came to him and commissioned him to produce a series of illustrations for their last world tour. 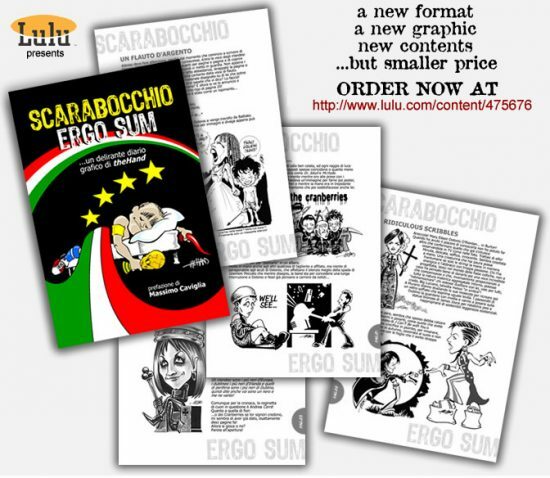 His new book, called Scarabocchio Ergo Sum, features works he created for the band and also more recent drawings of Dolores, Noel, Mike, and Fergal. The text is in Italian, but the spot-on caricatures are alone worth the price of admission. Media reports out of Italy this morning confirm that Dolores O’Riordan will perform at the newly reorganized 2006 Concerto di Natale in Monaco, formerly called the Vatican Christmas Concert. This year’s concert will take place on December 9, 2006, at 18:00 at the Grimaldi Forum, Monte Carlo, Monaco. Tickets range in price from €150 to €1000. The Vatican Christmas Concert ran for 13 years at the Vatican before Pope Benedict XVI cancelled it earlier this year, stating that he didn’t like pop music. This year’s concert will be moving to Monte Carlo, Monaco under a new organizer. The annual concert is broadcast nationally on TV in Italy, but this year’s concert will be shown by Raidue instead of Mediaset. This will be Dolores’s fourth time performing at the concert — her past appearances were in 2001, 2002, and 2005. You can read a press release over at Rockol and the o cial lineup here. We’ll have more news as it breaks. Thanks to Luca for the news! MTV Latin America has ranked The Cranberries’ “Linger” as one of the 100 “poppiest” songs of all time. The network chose “Linger” at #92 on last night’s “Los 100 + Pop” special. The series began yesterday and will run until November 24. Thanks to Cristobal for the news! 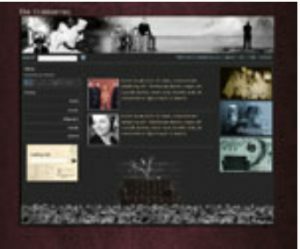 The redesign of The Cranberries Official Webpage has launched at http://www.cranberries.com (http://www.cranberries.ie has not yet rolled over to the new design). Not much new content, but there is a vastly improved lyrics section. There are no official forums yet (surprise? They were promised two and a half years ago. ), so instead why not join the largest and most active Cranberries forums online? The Official Community Corporation, the Toronto-based corporation that now runs http://www.cranberries.com today posted a preview image of the long-promised redesign of the official website. This will be the second redesign since Official Community Corporation took control of the site in 2004. Previously, it was operated by Timeless Music, The Cranberries’ self-owned management company. If the preview is accurate, it appears that an official discussion forum is in the works. No other new features appear on the preview layout. Spanish singer and actor Miguel Bosé told Reforma newspaper yesterday that that he had plans to record a duet with Dolores O’Riordan for his new album, but scheduling problems squashed it (also: AP report). Dolores was to duet with him on a song called “Partisano,” but the plans stalled due to scheduling conflicts. However, Bosé said he might still be able to record the duet at a later date. Miguel Bosé’s upcoming CD, due in February, will contain 30 duets including Ricky Martin, Shakira, Julieta Venegas, Juanes, REM vocalist Michael Stipe, and Alaska. Thanks to Paolo for the tip!